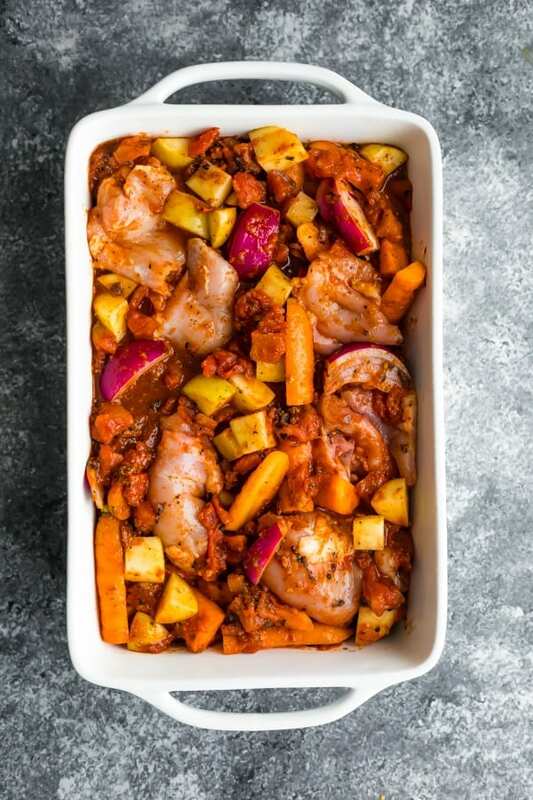 Portuguese freezer chicken bake is filled with nutritious ingredients: chicken thighs, carrots, potatoes, onions and a delicious tomato sauce inspired by Portuguese flavors. Easy to prep ahead and freeze, then thaw and bake for dinner. We are fresh off our Freezer Meal Prep Challenge, and everywhere I look these days, it’s freezer meals galore! 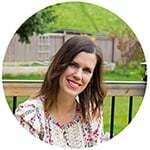 I have posted several freezer crockpot meals on this blog, and even a few freezer Instant Pot meals, but I don’t have many freezer oven recipes. 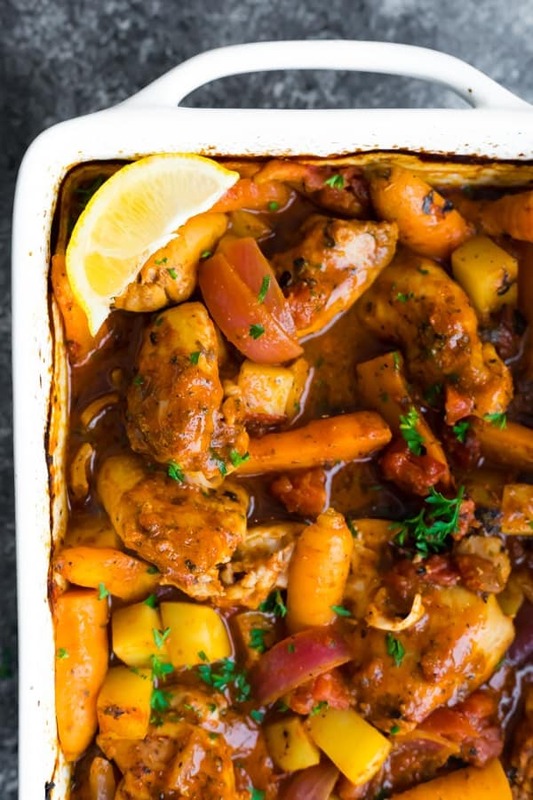 So…this Portuguese Freezer Chicken Bake is ticking that box today! Side note- I would certainly not go as far as to call this authentic Portuguese chicken, but I put together ingredients I saw in many peri peri chicken recipes and turned it into this delicious chicken bake. it’s full of healthy, delicious flavors! 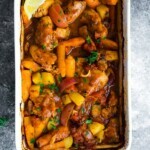 This Portuguese chicken bake is soooo delicious prepped fresh, but it is also great after freeze/thawing the ingredients! Assemble the fire roasted tomatoes plus all spices. Smush them around until they’re mixed up. Add the potatoes, carrots, onions, chicken. Squeeze out as much air as possible and freeze flat for up to 3 months. 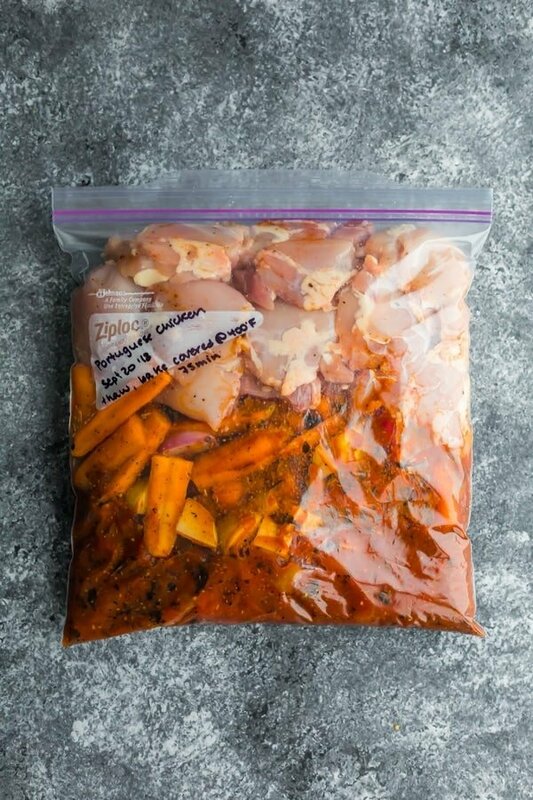 Can I freeze this Portuguese chicken right in the casserole dish? Sure you could do that! I don’t have a lot of freezer space and find the freezer bags really maximize storage. I am currently looking for a non-plastic alternative for a big batch recipe like this. Can I bake this Portuguese chicken from frozen? I have not tested this, but it may work. If you try it, I’d love to hear how it goes! I have read that adding 45 minutes on to the cook time for frozen ingredients is a good guess. Make sure you don’t put a glass casserole dish directly into the oven from the freezer, as this runs the risk of shattering. How long does this Portuguese chicken bake last for? Pre-baking (freezer)- at least 3 months. Post-baking (fridge)- 4 days, (freezer)- 3 months (we portioned our leftovers out with some rice and it was great). pictured above! This means you don’t need to use any wasteful aluminum foil when baking your Portuguese freezer chicken bake. These silicone lids come in a variety of sizes and are easy to wash and re-use. I have a 9 x 9 inch one as well! What to serve with this freezer chicken bake? We served ours with rice or some baguette to soak up the delicious sauce. Can I make this recipe in the Instant Pot or slow cooker? I haven’t tried but I bet you could! Instant Pot- I do worry the IP might be too full, remember to only fill max 2/3 full. 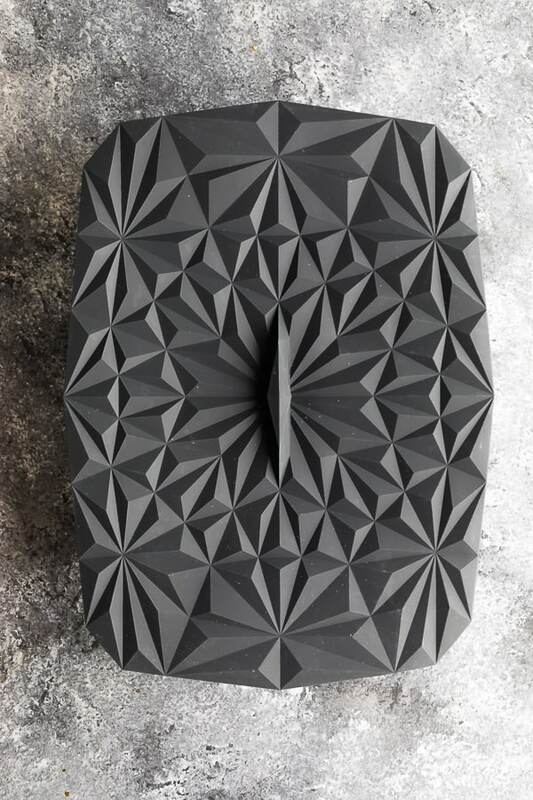 I would try 10 minutes high pressure with a natural pressure release for 10 minutes. Slow Cooker- I’d try 5 hours on low. This is my go-to time for boneless skinless chicken thighs! Don’t potatoes brown after freeze/thawing? That’s what I thought too, but I did not have this problem with this recipe. I suggest nestling the potatoes down in the tomato sauce, which may protect them from the air and oxidizing/browning. I used white potatoes for this recipe. I used this casserole dish from Crate & Barrel, but any *deep* 9 x 13 inch baking dish should work fine. Looking for more freezer to oven recipes? Try this Baked Ravioli with Butternut Squash, this Tuscan Pasta Bake, and this round-up with more than 38 Healthy Freezer Meals for Dinner! 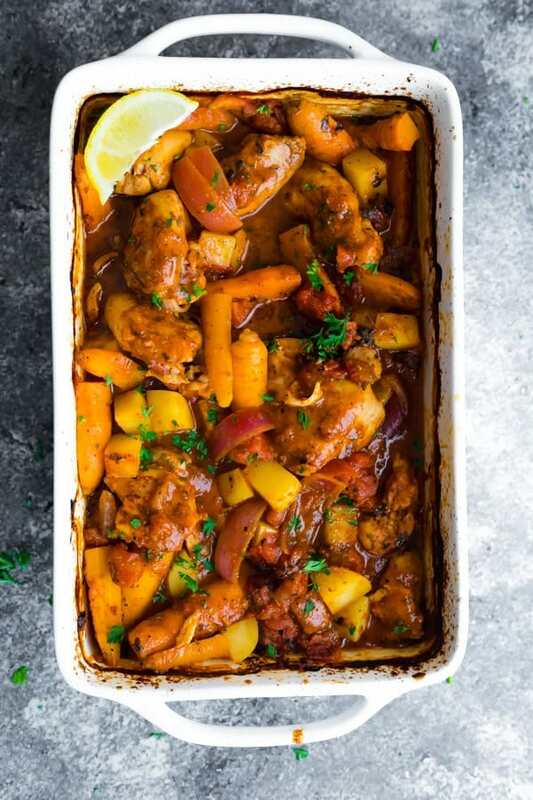 Portuguese freezer bake is filled with nutritious ingredients: chicken thighs, carrots, potatoes, onions and a delicious tomato sauce inspired by Portuguese flavors. Easy to prep ahead and freeze, then thaw and bake for dinner. In a large casserole dish (8 x 13 or larger), mix together the fire roasted tomatoes and all other seasonings together. 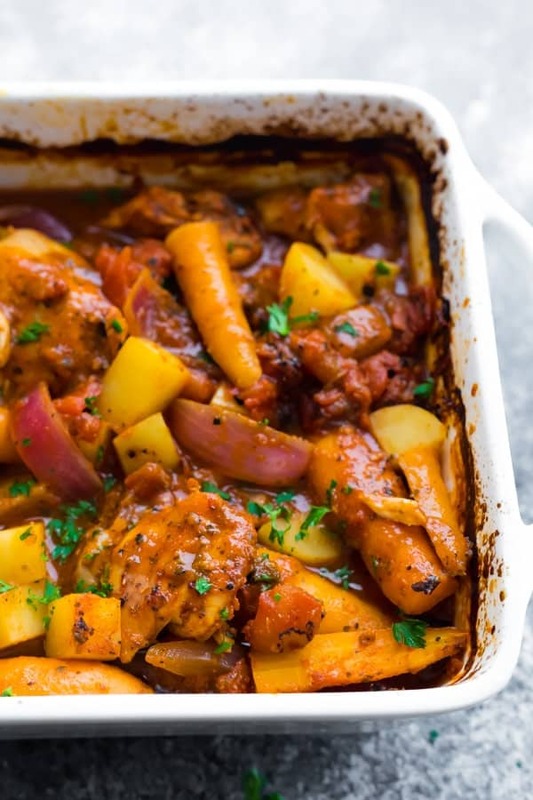 Toss the potatoes, carrots, onion and chicken thighs in the sauce. Cover the casserole dish and bake in the oven for 1h15 minutes. Check on the veggies, and return to the oven uncovered for another 15 minutes if they are still not quite done. Serve with lemon wedges and fresh bread (or rice). Combine all ingredients in a good quality gallon-sized freezer bag. Squeeze out as much air as possible and freeze flat for up to 3 months. To cook, thaw completely before following the directions above. We made this for dinner tonight and it was easy and delicious! The one year old was a fan, too! Denise I made this for dinner tonight and WOW! It was amazing. I was kind of hoping that we would eat half and I would have leftovers for a few days, but between the four of us we ate it all. So delicious! Must make recipe!! Another great recipe! I used bone-in chicken thighs since they were on sale, but kept everything else the same. I did use a crockpot though and cooked them on high for about 4 hours. I used a disposable slow cooker liner for easy cleanup. If I make this recipe for lunch for the week, how long do you think it will last in the fridge? Thank you! Hi Kimberly! I have a 4-day rule for the fridge…chicken is not food safe after that. Can I make this using chicken tenderloins? My family won’t eat chicken thighs! Hi Sheila! I bet it would work if you added them in at the very last 15-20 minutes of cook time! one and a half hours at 400 degrees seems to be a really long cook time. for fresh thighs….. is this a typo error?